- Able to protect all kinds of data formats. - AES 128bit encryption standard. - Available for normal usage and data security. - Device capacity: 4 / 8 / 16 / 32GB. A way to make digital data protection easy and fun. USB DataSecure could be the best equipment for enterprise staffs , exquisite gift for conference attendants and association members . 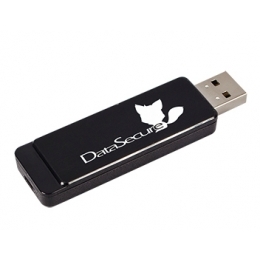 What can USB DataSecure bring to you? USB DataSecure can be an secured storage device, wherestored data can neither be viewed by someone nor be copied onto another PC. or confidential data safe and help to transport it securely. accessfrom the right person ,and make sure the business confidential data be firm and unconquerable. Just few steps, users can easily protect their own digital data. user do not have to install programs & drivers or get confirmation on-line from manufacturers, and also need no Hi-Tech background. Only three steps, personal data can be totally stored into a safe, and become eternal secret with mystic masks. A wonderful gift for customers ,members or audiences. gift for customers, a nice publicity for association and a specific symbol of enterprise or organization. That is to say USB DataSecure solution could be both a useful data protection solution and a valuable memorial .